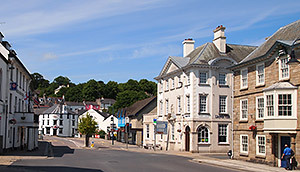 Located in the centre of Devon, on the north edge of Dartmoor (just off the A30), Okehampton is an ideal base from which to explore Dartmoor and the North Devon area. The town has one hotel and a few guest houses, so prior booking is advisable during the main holiday periods as this area is very popular with tourists, cyclists and walkers. And for those who enjoy horse riding there several excellent riding stables in the vicinity. There has been a settlement here since Neolithic times and the town occupies a strategic position along the main route from Exeter to Cornwall. However, the settlement has never really exceeded its boundaries and still remains as a fairly small market town to this day. The town's modern history started around the construction of the Norman Castle, by Sir Baldwin de Brionne, shortly after the Norman conquest (circa 1086). 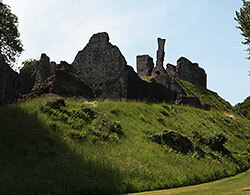 In its heyday the castle was one of the most powerful fortresses in the West Country and substantial ruins of the castle and its keep still survive. There are many buildings of interest around the town, including the 14th-C Parish church with stained glass windows by Victorian artist William Morris, a fine 17th-C town hall and the White Hart, a most handsome Georgian coaching inn. Also along the main high street is a restored 19th-C mill, housing the Museum of Dartmoor Life, an ideal place to begin any exploration of the town. The town also has a good selection of shops and an interesting Victorian arcade, reminiscent of the Burlington Arcade in London. A farmer's market is held on the 1st and 3rd Saturday of the Month, selling local produce from nearby farms, amongst other wares. On the hillside above the town is the beautifully restored Victorian Okehampton Station, part of the Dartmoor Heritage Railway Line, which runs from Coleford Junction to Meldon Quarry in the Dartmoor National Park. 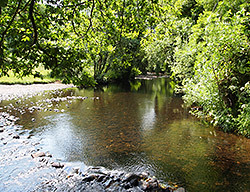 Meldon is an ideal destination for walkers who wish to explore the northern reaches of Dartmoor. Social history museum covering three floors of an early 19th-c mill. This interesting little museum tells the story of the moorland and how it has shaped the lives of the local people. Also located in the central courtyard is the Tourist Information Centre, craft workshops, gift shop and tearoom. The station opened in 1871 as part of the Devon and Cornwall Railway (and later part of the LSWR) but fell into disrepair when it closed to national network services in 1972. The station and line were refurbished and reopened as a heritage line in 1997. Today the station contains the headquarters of the Dartmoor Railway, with a goods yard, museum and buffet restaurant. Facilities: parking, ticket office, buffet, model shop, museum, toilets. The great stretch of scrubland between Okehampton and Meldon was once Okehampton Park, the medieval hunting grounds of the Courtenay family, who once lived at Okehampton Castle. A small section of these grounds, (alongside the south bank of the West Okement River, adjacent to the castle), consisting of flora rich meadowland, grassland and woodlands has been designated as a Local Nature Reserve (LNR) and is open to the public.